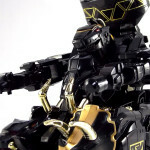 At long last TokuNation is proud to present a really special gallery for you. 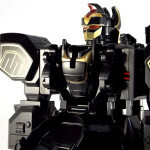 Following up on our recent 14K Gold Galaxy Megazord Gallery, we have another blast from the past to share. 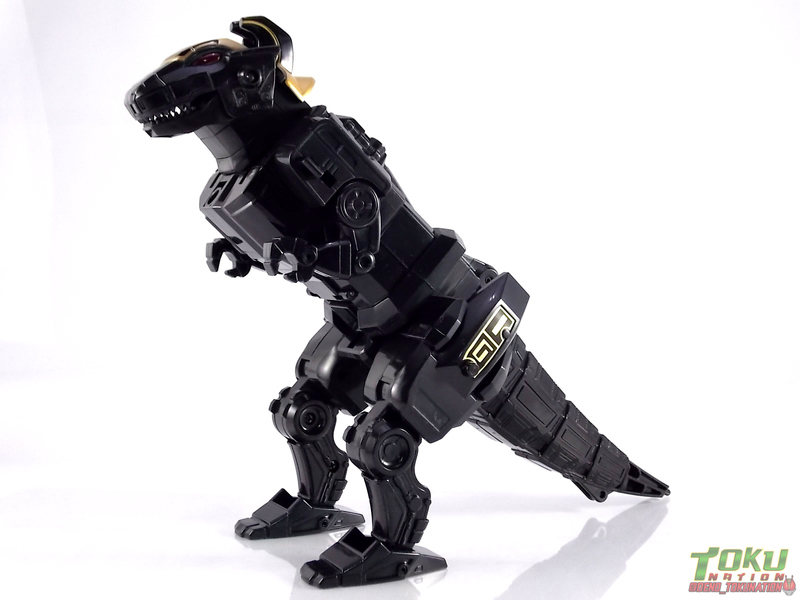 You know the series that started a massively successful franchise in the west, Mighty Morphin Power Rangers. You know the series that gave it life, Kyoryu Sentai Zyuranger. 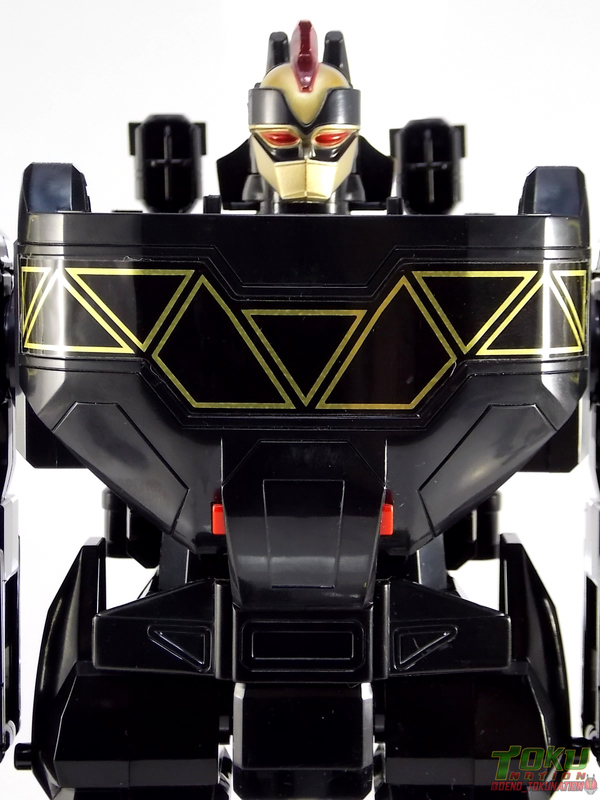 Now we’re taking you back to another first, the first black sentai mecha repaint ever. 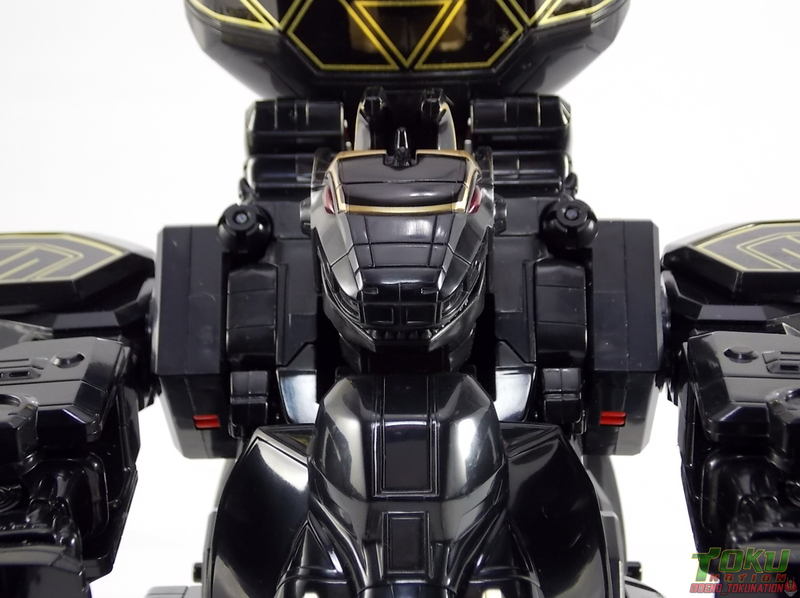 DX Black Daizyujin! 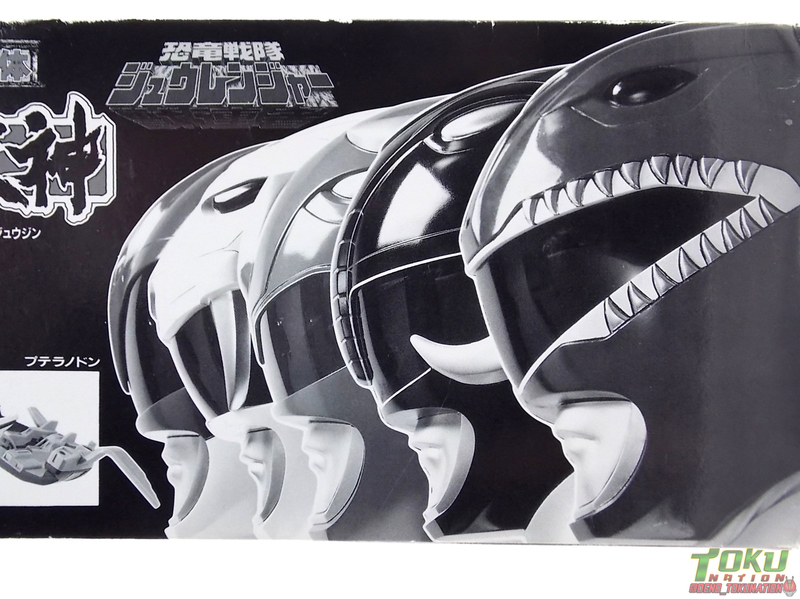 This gorgeous release was on store shelves in 1993 near the end of Zyuranger’s televised run. 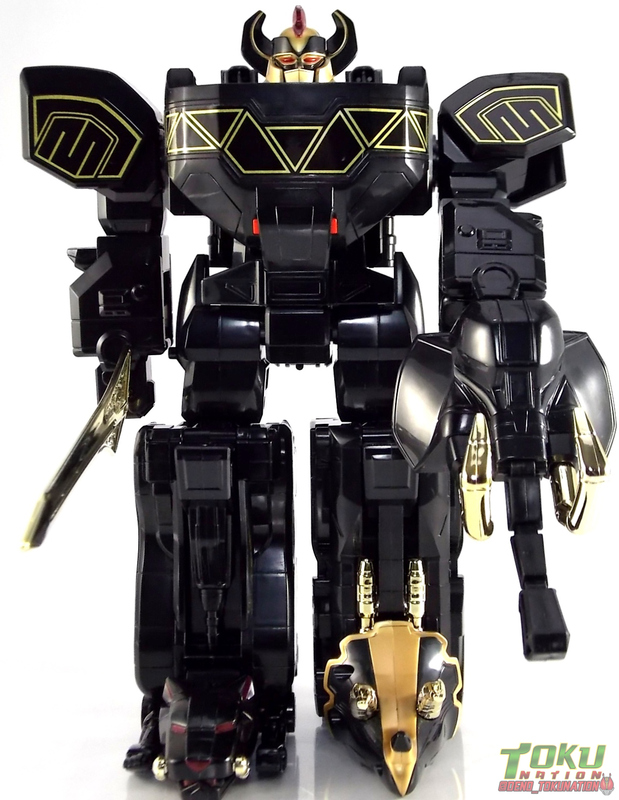 Undoubtedly many western fans recognize this mecha from the Bandai America Black & Gold Megazord release, and the recent Legacy version of said toy. 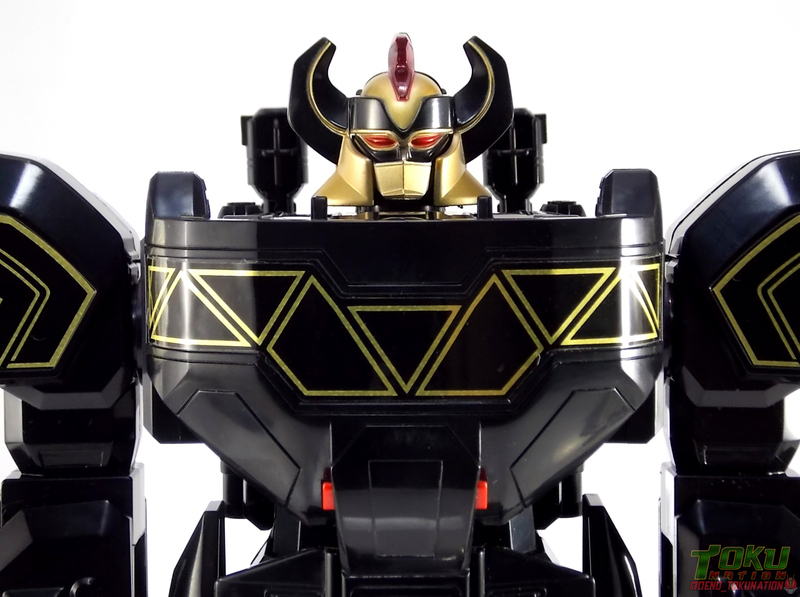 That vintage release was itself a mere repackaging of Black Daizyujin, the originator of the black repaint concept for Super Sentai & Power Rangers. 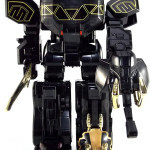 At one time this set retailed for 8000 yen, today it commands prices in excess of 60,000 yen. 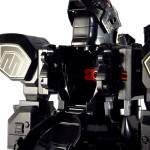 But we managed to get an incredible deal on one thanks to the amazing folks as Serious Toyz. So that brings us to this, a massive gallery totaling over 100 images of this rare and unique set. 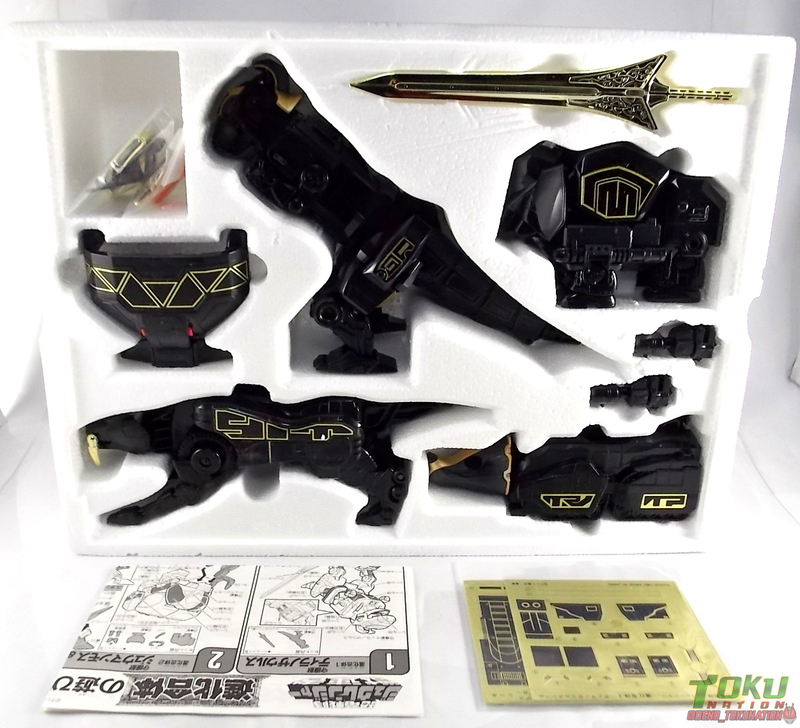 We’ve done our best to show off each Guardian Beast, the combined Dinotanker mode, and the mighty Daizyujin & its’ glorious gold chromed Dinosaur Sword God Horn. 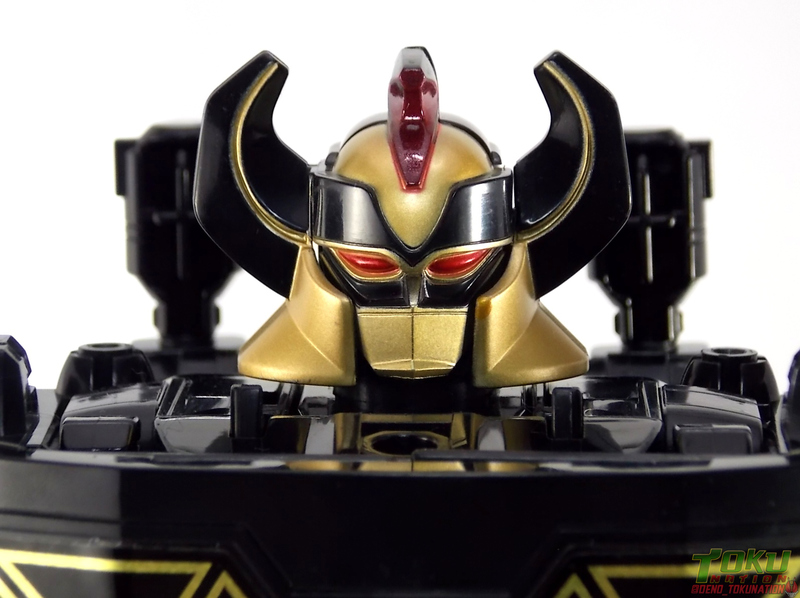 We’ve attached a pretty sizable selection of this images to this post, but the entire gallery can be accessed by clicking “Discuss on the TokuNation Forums” at the bottom of this post. It's time to share an incredibly special gallery with the community once again! Made possible with no more than shear luck and some patience, we've uncovered a real gem for today's subject. Dating back to 1992-93 is of course Kyoryu Sentai Zyuranger. 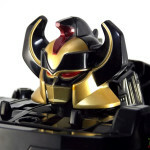 The series known the world over as the basis for Mighty Morphin Power Rangers in the west. 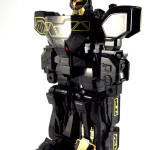 Zyuranger set many firsts for the sentai franchise, but it's toyline also had a huge contribution to the tradition of the brand, the black repaint! 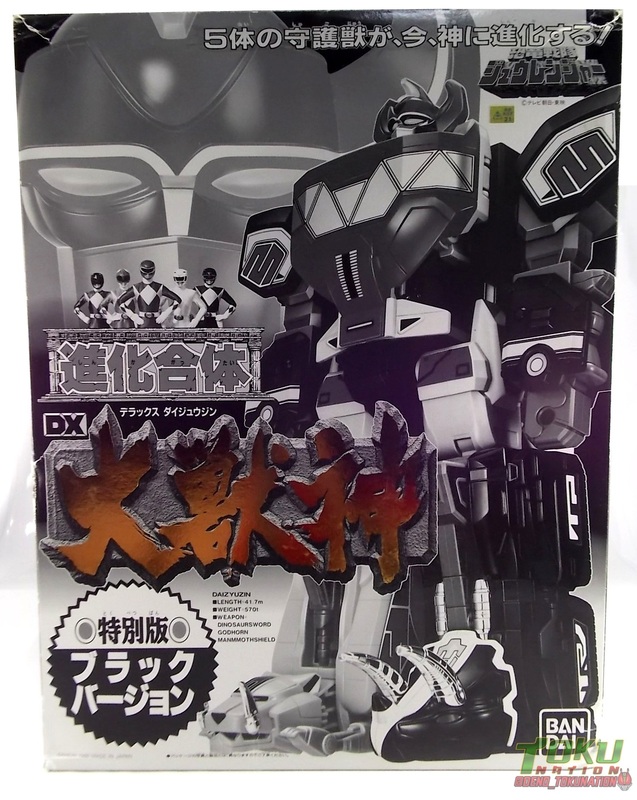 So today we've managed to get our hands on what's increasingly become one of the most rare special sentai releases ever, the DX Black Daizyujin! 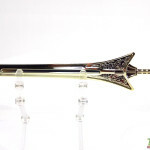 Post 3: Daizyujin & the Dinosaur Sword God Horn! 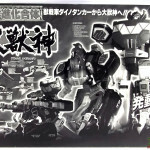 Black Daizyujin's packaging is basically identical to that of the standard release. 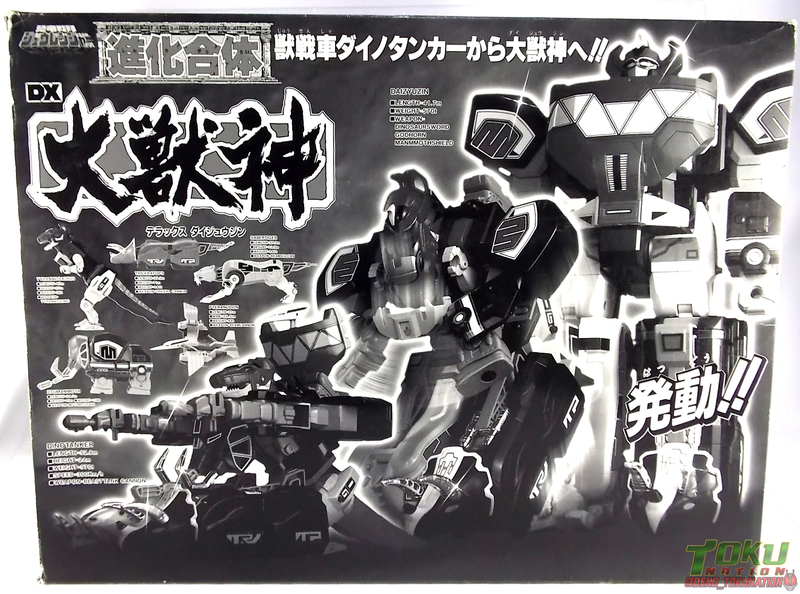 It's the exact same box, just done up in blacks grays and whites with Gold metallic for it's name in Japanese. Otherwise there's no change at all. It always fun to review a vintage release like this as well because I still love love the old classic styrofoam trays these sets come in. That and at least in this case, the statistics for all the Guardian Beasts as well as Daizyujin are listed. 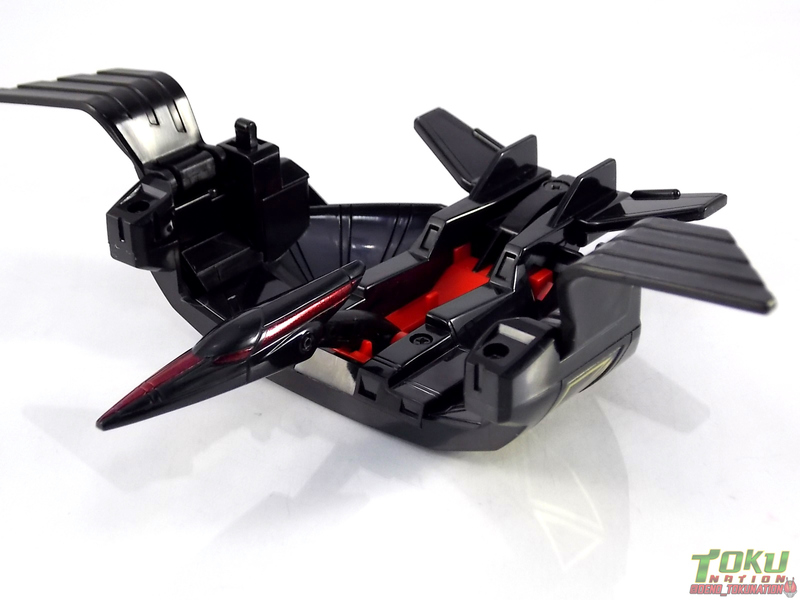 Even the Dinotanker mode. These kinds of stats are trivial and ultimately don't mean anything in regard to the toy on hand, but I love in universe factoids like this. Now as for the included paperwork, the instructions are a identical to those from the standard release. 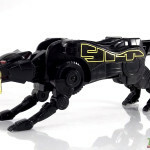 The label sheets included however are complete recolors. 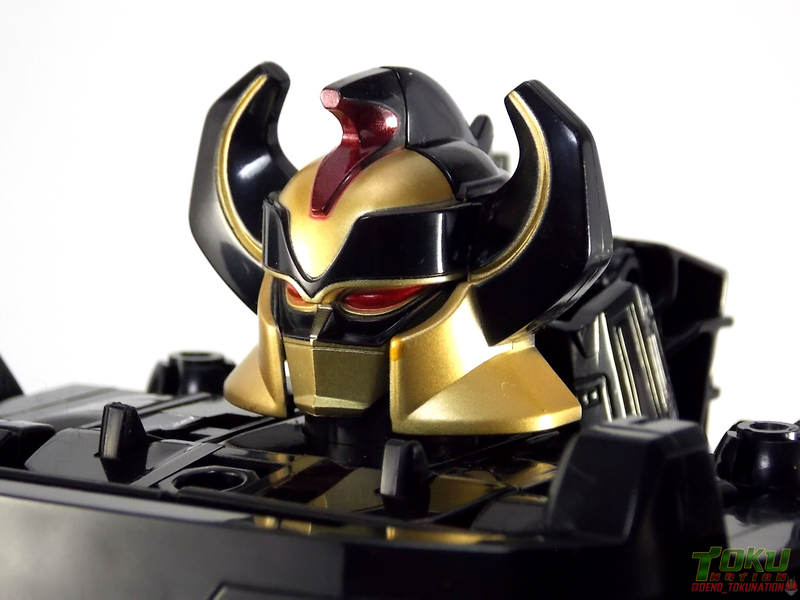 In nice bright Golds, blacks, and with some minor red accents. Now I didn't use these labels at all. 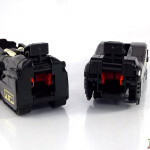 I simply couldn't bring myself to ruin them as replacements would be impossible to find. I was terrified of them peeling back off at some point. My purchase of this set was primarily driven by the incredible deal i got on it. I wanted to take the time to do a nice complete gallery for the site, and then hopefully flip it for a profit so I could purchase a new camera to continue bringing you guys great new content. Now I did have to snip the parts off the various included sprues in order to complete the look of each beast. But that's it. So I present to you each of the main 5 Guardian Beasts of Zyuranger! Now truly what is there to say about the functionality of the individual components at this point? 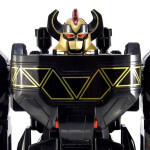 I can assume that many of you have at least some experience with the US Megazord release of this toy so you know what to expect. Again there's going to just be stark contrasts in colors with these figures compared to their standard counterparts, US or Japanese. 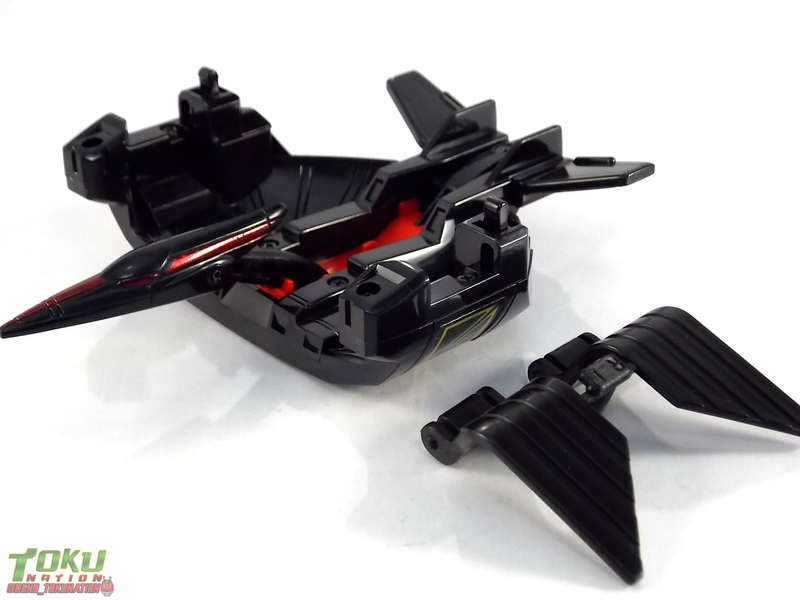 That's just the nature of Black repaints. 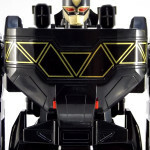 Which if you were unaware, Black Daizyujin was the very 1st sentai release done in such a color scheme. 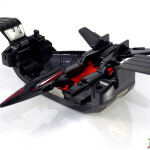 The precedent set by this release has allowed for such sets as Black Gaoking, Black Ultimate Daibouken, Police Gunbir-Oh, and even had an influence on such figures being released in Western markets. While the colors are a bit dull, please remember that I never applied the labels to these figures. So they don't look as flashy as they normally would. 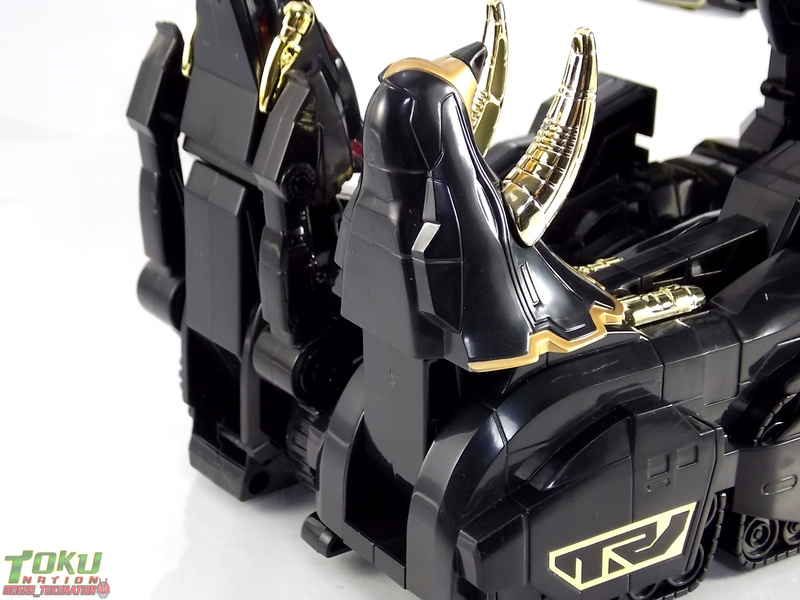 Some really great gold trim and surprisingly some deep crimson red accents break up the monotony though. 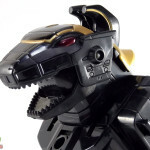 The red can mostly be found on the Tiger with some minor applications of it to the Pterodactyl & Tyrannosaurus as well. 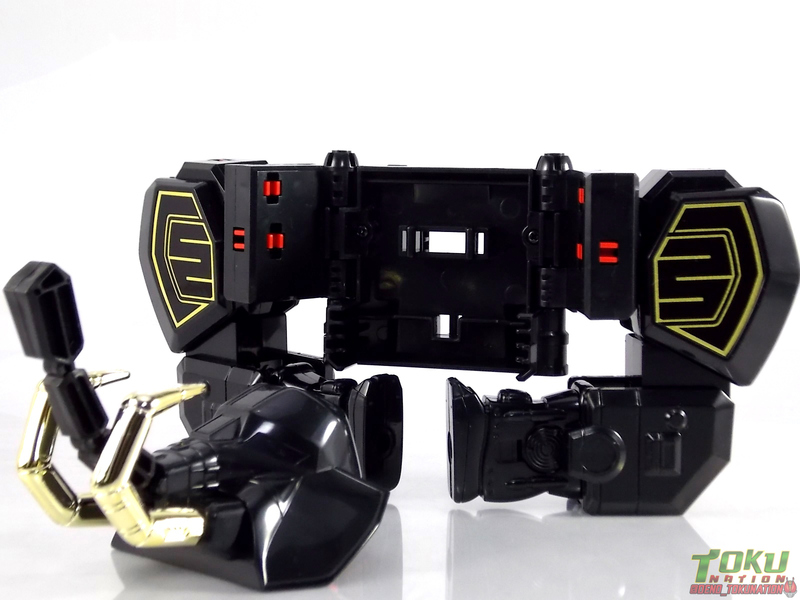 One thing to note at this point though are the parts that actually weren't cast in black plastic. 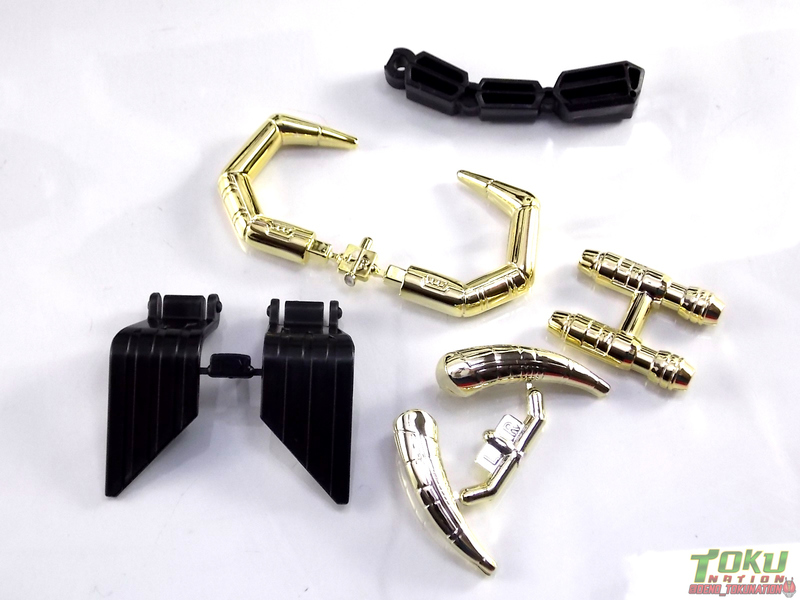 In fact all of the clips on the Mammoth, release triggers on the Tyranno tail as well as the clip for the backpack, the interior panel of the Pterodactyl, and even the knee connectors in the Triceratops & Tiger are all still cast in red plastic. 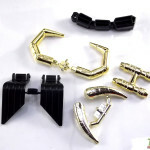 For some reason these components alone could not be made in black plastic. 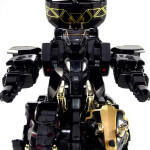 In their individual modes they really aren't noticeable, even less so in either of the combined forms. But that red really stands out against gray and black once you've noticed it. As mentioned above I had to remove some parts from sprues to complete the physical look of most of this set. Horns and the tail piece for the Triceratops, tusks for the mammoth, & wings for the Pterodactyl. 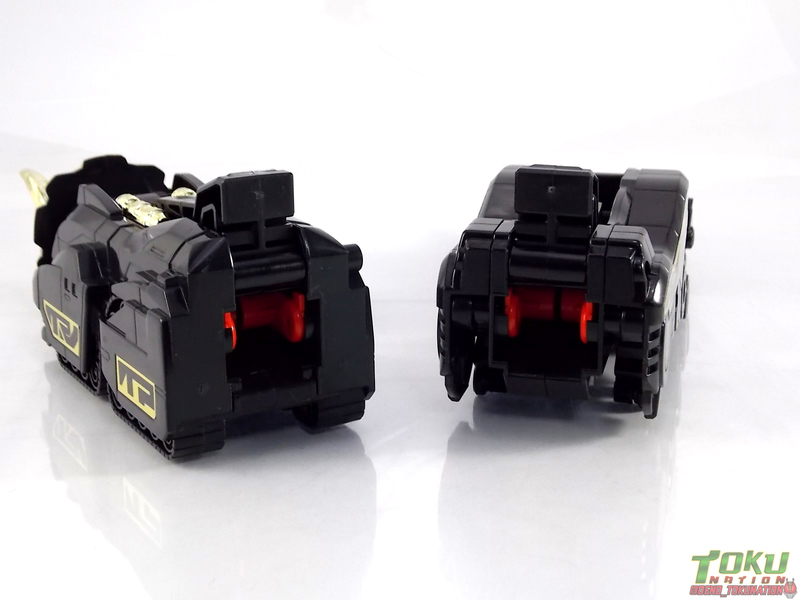 I've included step by step images below for how to get the Guardian Beasts into their first combined mode, Dinotanker, but it's simple. 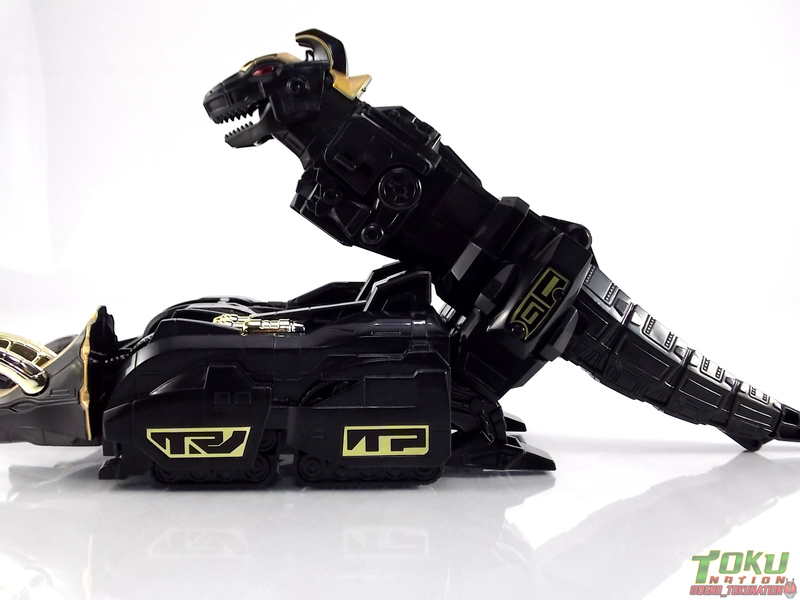 Really you just need to lay out the Tiger flat with it's tail flipped up, flip the tail up for the Tricera, and plug the Tyranno's knees into each. 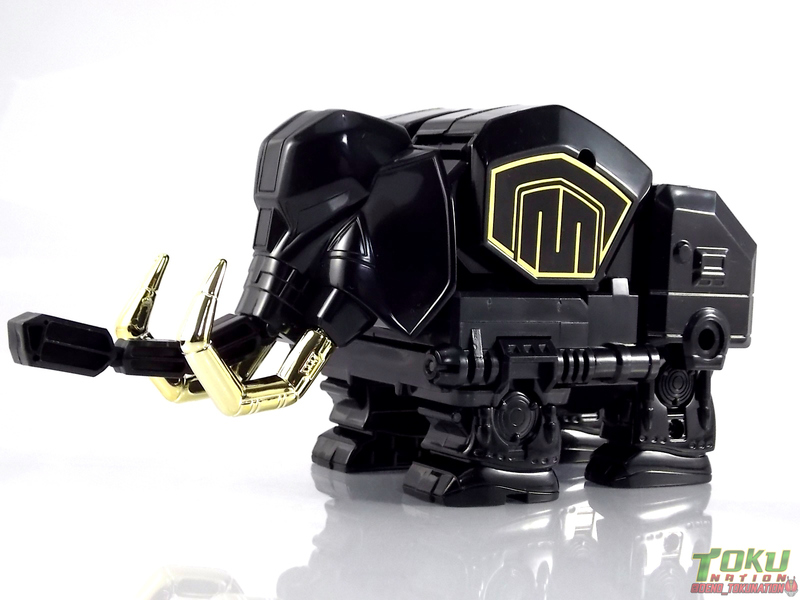 Fold out the Mammoth arms and attach the backpack and shoulders. Then snap the Pterodactyl in between the Mammoths feet. 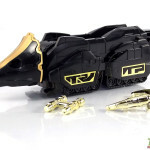 The "feet" of the Pterodactyl are actually small cannons you need to plug into the Mammoth's feet to create the Dinotankers' Beast Tank Cannons. 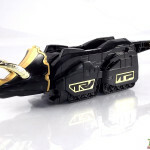 The Mammoth Shield also needs to be plugged into the small port under the Tyranno head, and the trunk pointed downward. 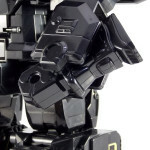 This is a, for lack of a better word, beastly combination that looks really intimidating in all black. 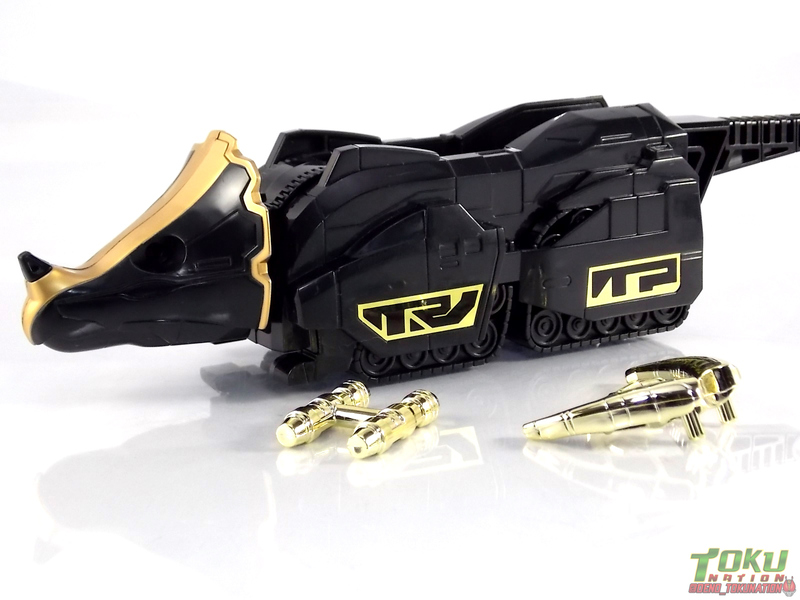 It looked cool if a little disjointed in normal colors but the uniform color scheme really helps sell the idea that this thing is a literal tank. 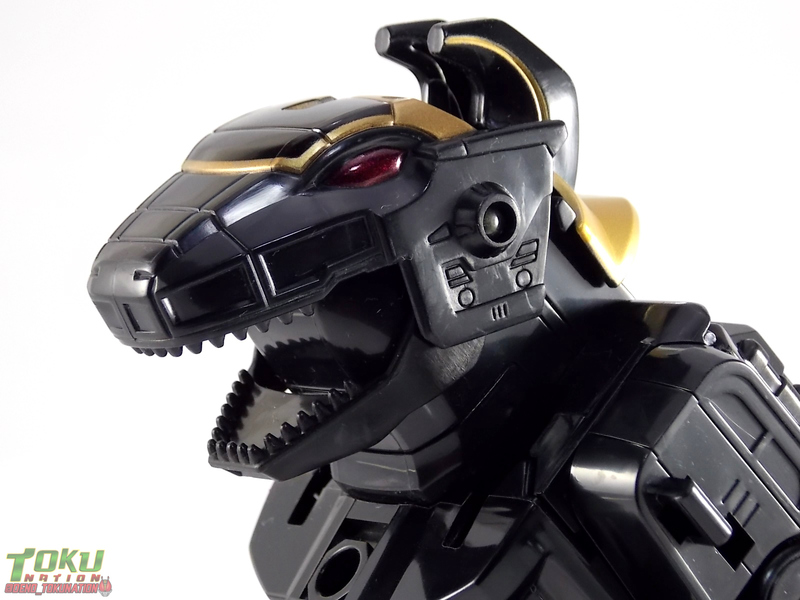 The mighty Daizyujin can be formed straight from Dinotanker mode by simply removing a few components. 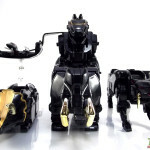 The Mammoth Shield, Pterodactyl, & Beast Tank Cannons. 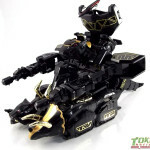 Once removed, flip up the Tiger & Tricera heads and stand the combination fully upright. Rotate the arms down and the fists out. 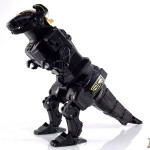 Plug the Beast Cannons on the back of the backpack and flip the Tyranno tail up to lock the backpack assembly firmly together. 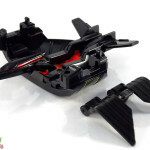 Then open the chest cavity and rotate the Tyranno head down revealing most of the head for the combined form. 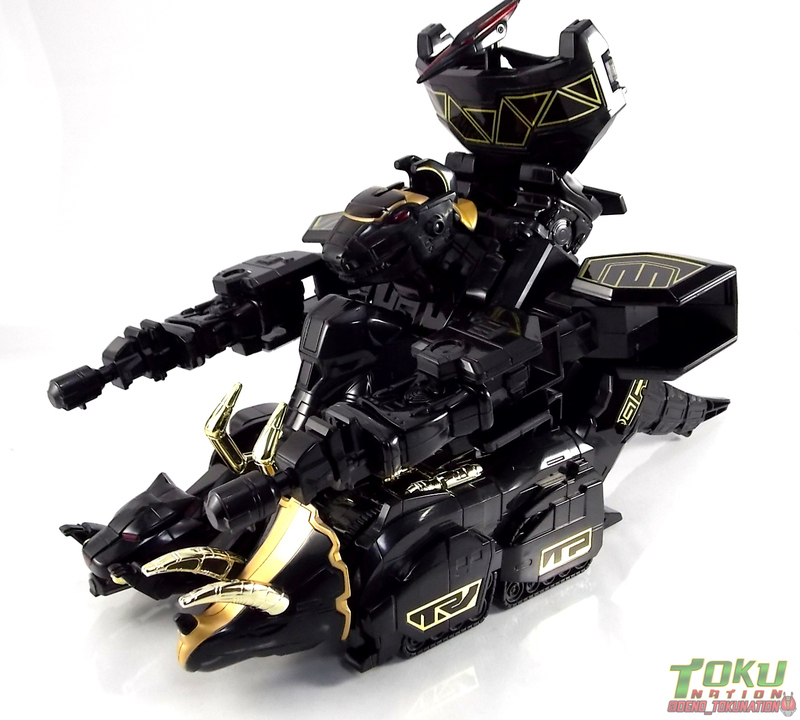 Close the chest back up, plug the Pterodactyl on, then simply rotate the horns out and Daizyujin is formed! 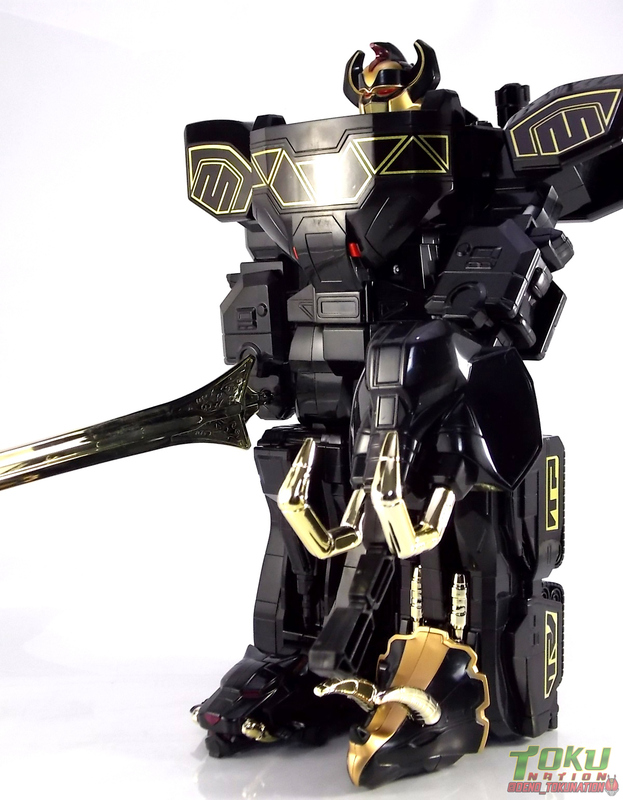 As the progenitor of the entire Black Sentai repaint concept, Black Daizyujin is magnificent. 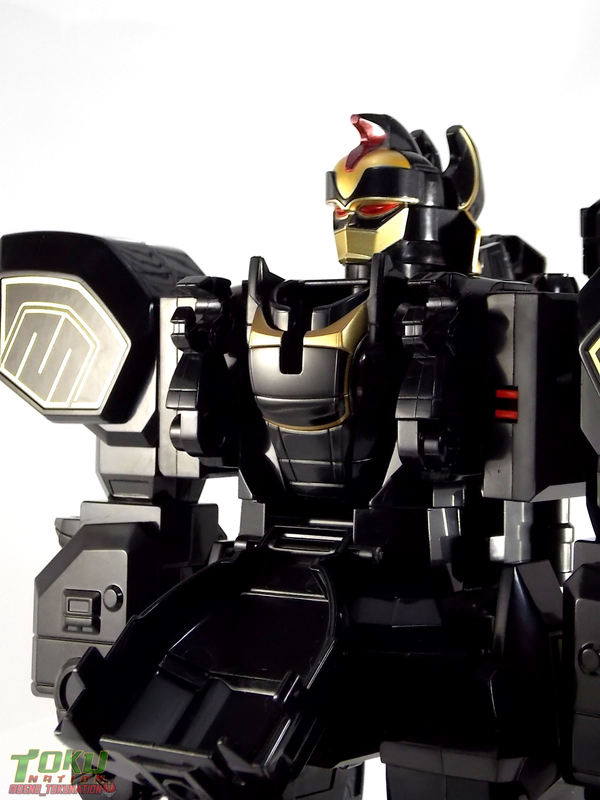 When fully assembled the uniform black with gold trim helps unite this set into a truly cohesive, regal, and menacing looking robot. 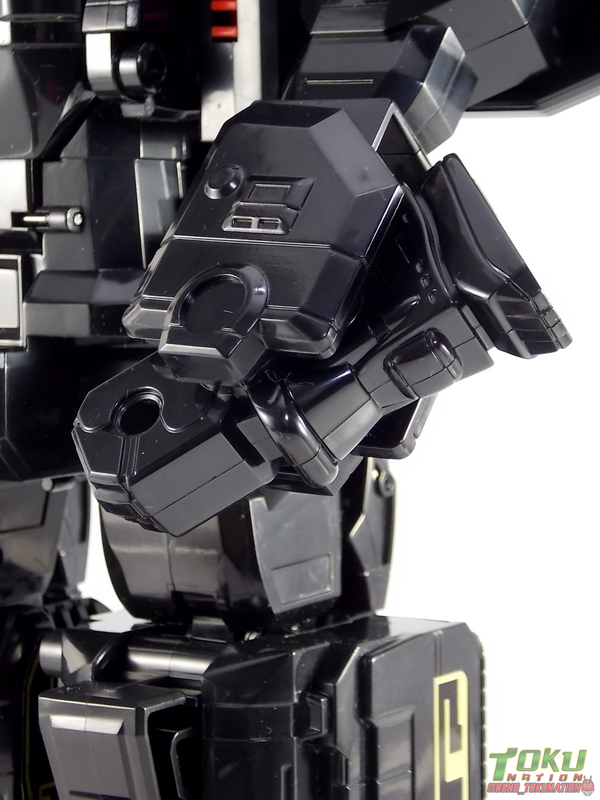 The original is undoubtedly a cool and classic design for many, but the black repaint helps unify the elements of it properly. 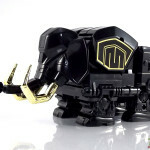 My only gripe is how much gold is present on the Triceratops, which throws off the balance of the set. 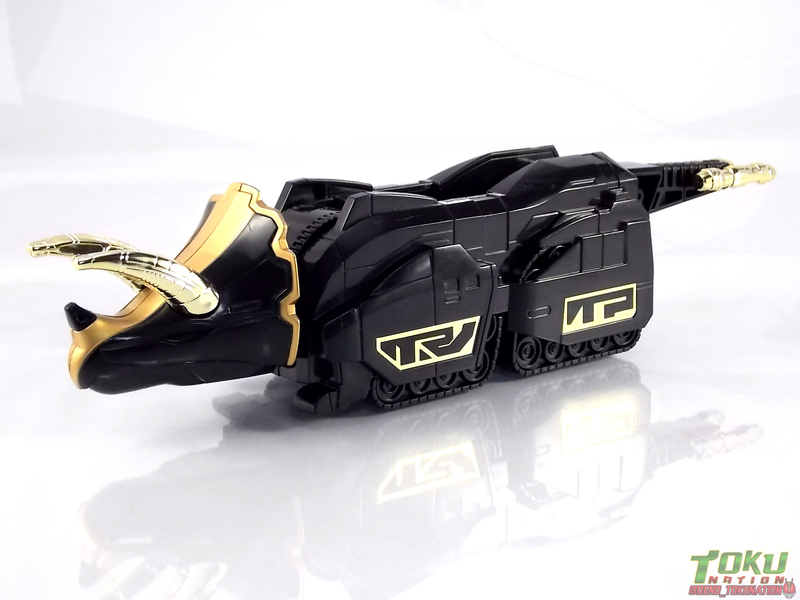 The Tiger doesn't have the same gold trim. But again I also didn't apply the labels that help contribute to a more consistency look with the set. 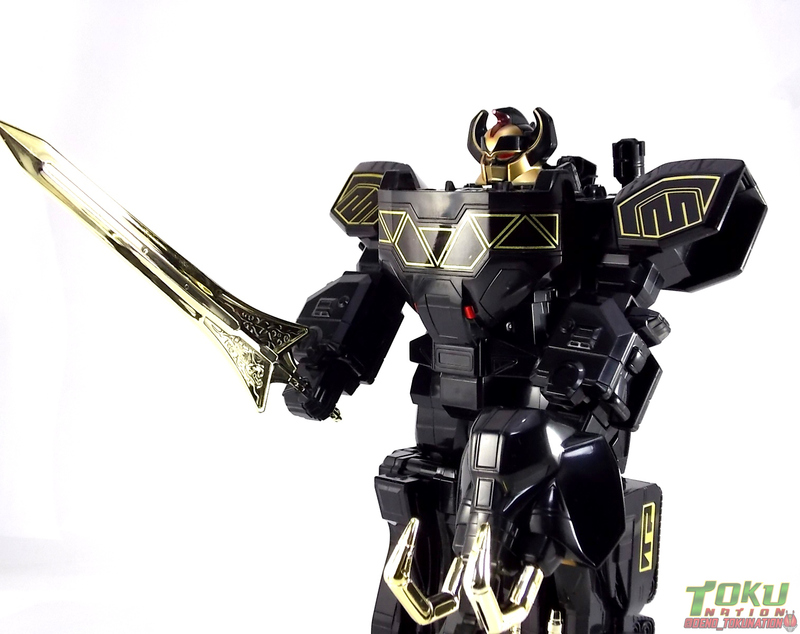 But as black repaints go, this is one of my favorites. 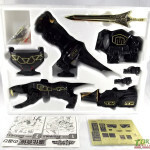 To really complete your displayed Black Daizyujin you need to equip it with the leftover Mammoth Shield, and the fully gold chrome Dinosaur Sword God Horn! 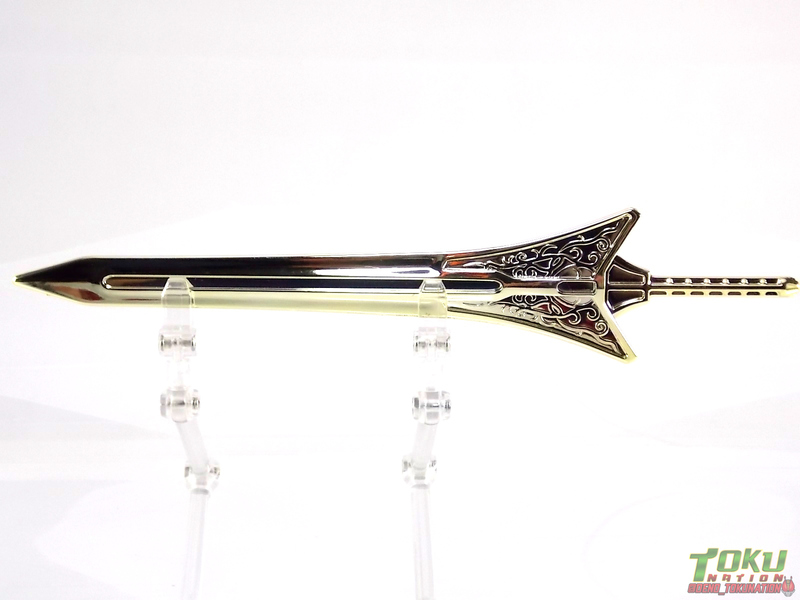 The wonderful design of this sword looked good in classic silver but something about that gold just really works for me. 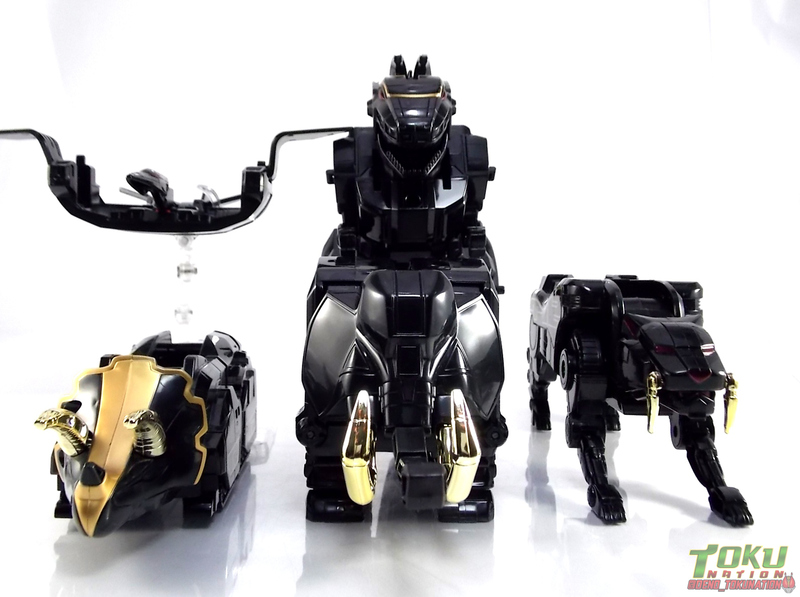 As a complete package this set looks fantastic. 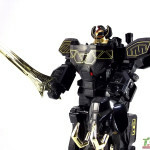 While Black repaints may not appeal to everyone, DX Black Daizyujin is the first, it's a classic in the truest sense. 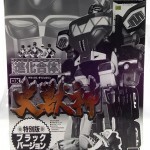 It's also one of the rarest vintage sentai mecha out there. I lucked into this set for a very small fraction of what it normally sells for. 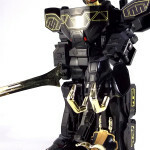 Often Black Daizyujin commands prices in the 60,000+ yen range and can be next to impossible to find with the label sheets intact. 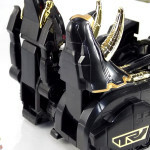 As you can see from the pictures below, at one time this set was available for a measly 8000 yen retail. What a difference nearly 25 years can make. If at any point you find that you have the disposable income available, or can find this set for a decent price, I urge you to purchase it. If you'd like, please feel free to take a look at my currently running auction for this set as well. 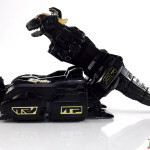 The sale of this piece will fund the purchase of a new camera so I can continue to generate new content for TokuNation. Thanks! 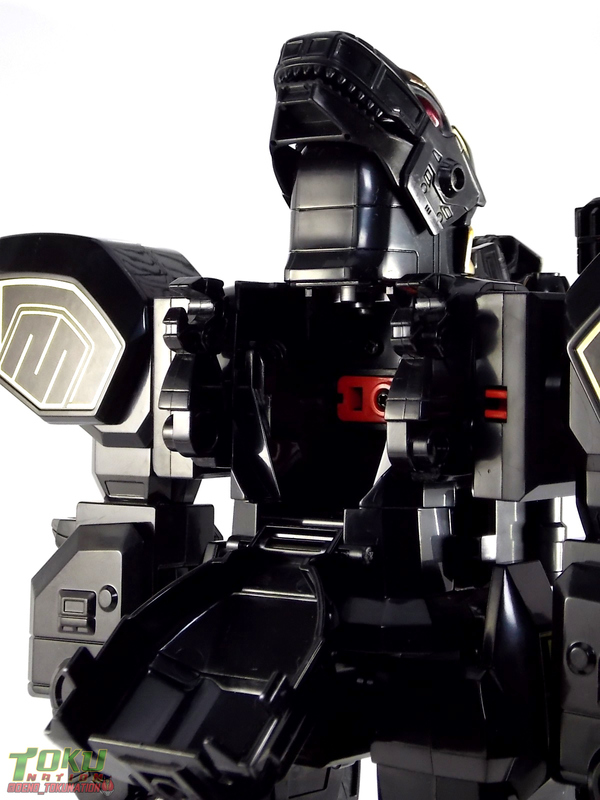 Seeing the little snippets of red really makes me wish that there was a black and red Megazord/Daizyujin. As eye rolling as the color scheme is, it doesn't change that it's still quite a nice looking combination. Oh well. I do like the look of this. 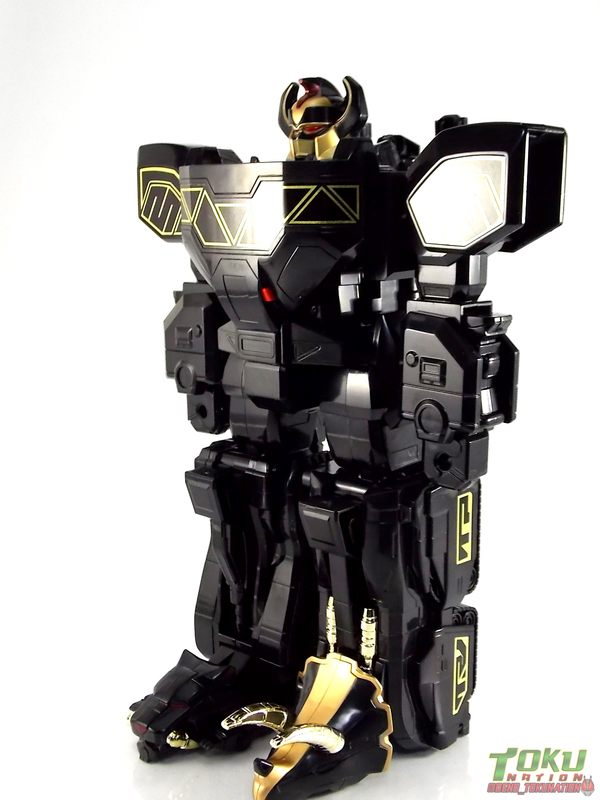 While I love combining mecha and the end result hodgepodge that makes it clear that it's 5 individual pieces, the uniformity of the black and gold releases (Or, well, nearly all black here) is still something quite nice to look at. Shame you're gonna flip it. Definitely a classic. I hope it sells quickly for you. Same here. My camera is literally falling apart This gallery along with 1 or 2 others previously shot that I'll be releasing soon, are the last of what my current setup will be handling. This was a really fun shoot though. And while I like to own nice high end pieces, at a certain point I like to handle them and photograph them just as much. I don't necessarily need to own some of these things to enjoy them. While I'm obviously going to make a profit in this instance, it'll be a reinvestment into my own skills as well. 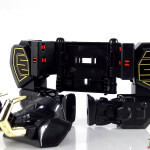 And another fan somewhere out there whose always dreamed of owning this set will finally have that opportunity. 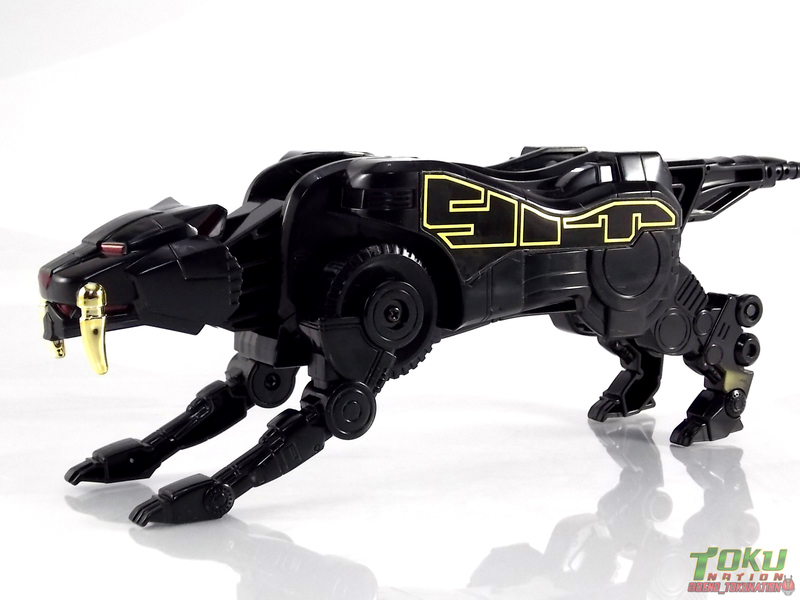 Ok, I think I know the answer to this, but I just want to confirm: The toy and stickers themselves are identical to the US release, right? 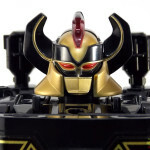 BoA didn't change the sitckers or anything like the regular Megazord? Weirdly no, it wasn't changed at all. 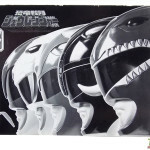 It's a direct repack of this set in a new box. This is a very sweet looking thing. And it's so cheap! 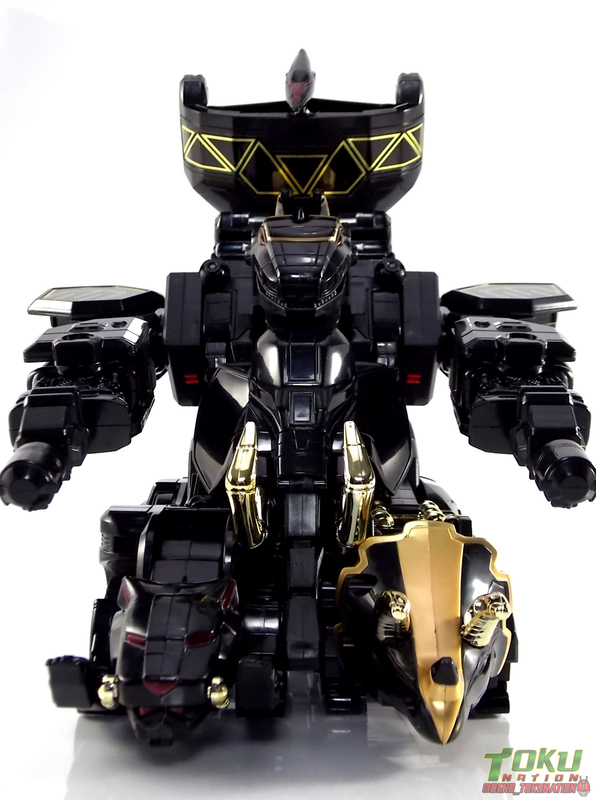 I have to admit, I've never quite gotten why Bandai and even other companies do black and gold variants on DX/robot toys. 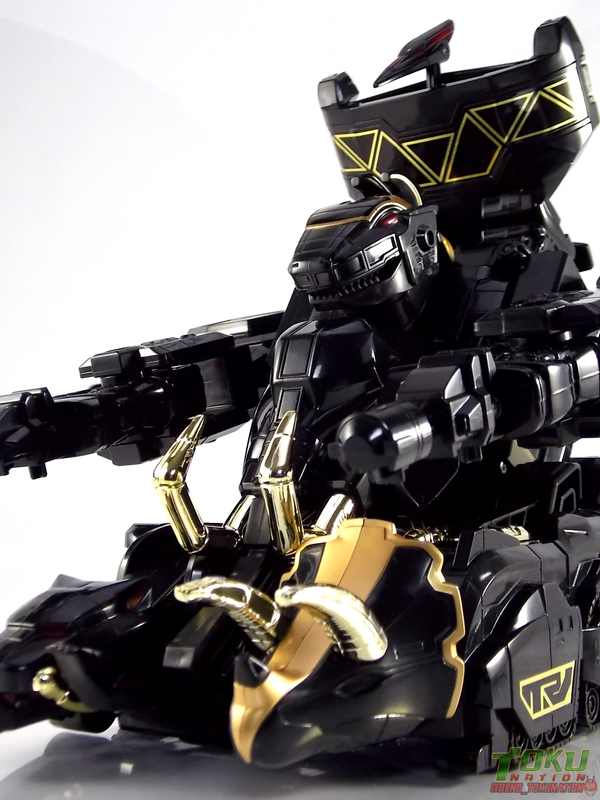 Not knocking it, heck some of them look amazing (such as Daizyujin here). Just one of those things I don't quite get. 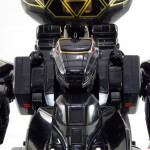 S.H.Figuarts ShinkocchouSeihou TaToBa & TakaKiriBa Revealed!